Mix the raisins, lemon peel and almonds with the rum and vanilla extract and keep aside. If using a food mixer, mix the flour, sugar, salt, crumbled yeast and lemon zest and pour in the milk and the egg. Start kneading using a low to medium speed until it starts to come together as a dough. Add the softened butter and the marzipan a little at a time until it is fully incorporated and increase the speed until the dough is smooth and elastic. Add the dried fruits and the chopped almonds and mix in the dough. Transfer the dough to a bowl, cover with cling film and allow to prove until it doubles in size (you can either do this by placing the bowl in the steam oven at 40°C or in the warming drawer using the lowest setting). Turn the dough out onto the work surface and shape it into a large oval. Fold the dough in half lengthwise and press the folded side slightly to help the loaf keep its shape. Carefully lift and place onto a baking tray. 7. 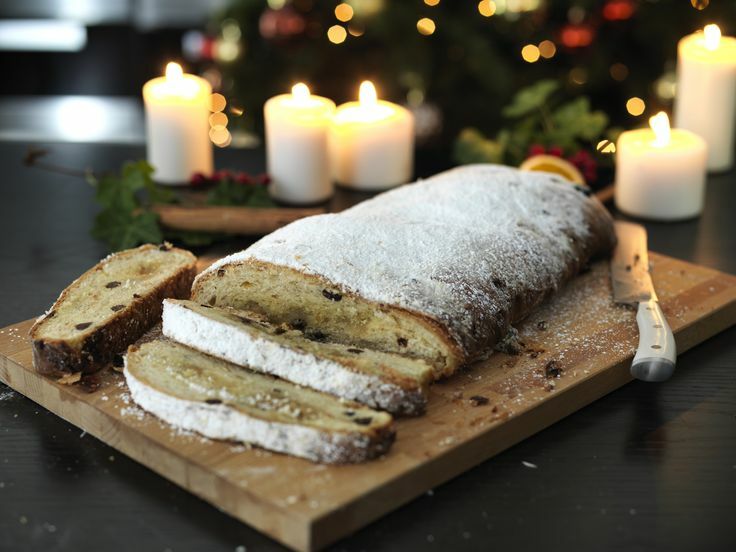 Remove the stollen from the oven, place on a wire rack and brush all around with melted butter. Finish with a dusting of icing sugar.